Kit Rae Black Jet Triple Throwing Knife Set | BUDK.com - Knives & Swords At The Lowest Prices! 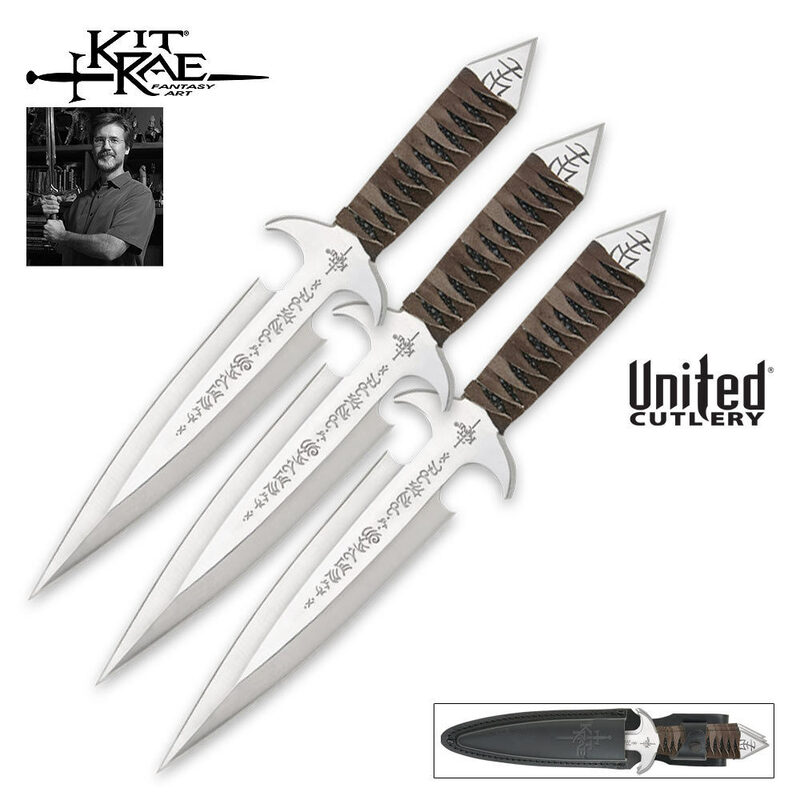 These Kit Rae Black Jet throwing knives are perfectly balanced for supreme throwing accuracy. The unique styling and fantasy etching also make for great daggers. Each knife is constructed from one solid piece of stainless steel with leather wrapped grips. Had these knives one day and hit flat once and the knife broke in half not to mention after further review the metal looks like cast and for being stainless a magnet sticks to it would not recommend these to anyone. I have had these knives for three weeks now. Two tips broke off about 3\8 inch and one of the knives broke in half at the narrow waist. These knives penetrate deeply and are easy to sharpen but they are a bit fragile. 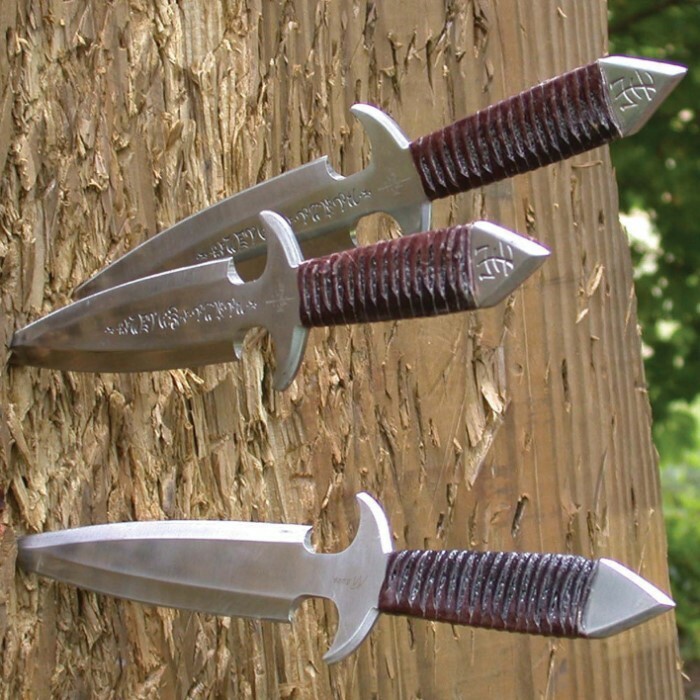 Great throwing knives. Wouldn't recommend them for the spin throwing method as the blades have a decent edge. They work spectacularly with the no spin method of throwing. They have enough heft for serious penetration, and feel comfortable in the hand. The sheath is nice leather too, and feels comfortable on the hip. overall good throwers and are very sturdy, however the leather hand grip is terribly weak and you might as well take it off right away, do not expect to simply throw them and have them stick into target. not good for the no spin technique. These knives are amazing, I've only broken one, the handle wrapping came off quickly. They are heavy, stick deeply, and feel amazing. Everyone whom I showed this to, after telling them how much it cost, said it was the best deal they'd ever seen. Really worth while. Heavy, but well balanced. Extremely durable. Very nice laser etching on the blade to make the knives extremely good for a collection. The leather wrappings hold up well and have a nice grip to them. Only downside: They almost look too nice to throw. Very nice knives. Solid, much larger/heavier than I expected. Honestly, they're almost too pretty to throw. Definitely recommend these for someone that likes heavier knives, if even just for display.